*Area, Population and Density rankings refer to Burlington’s relative position among Vermont’s 255 civic entities (9 cities, 242 towns, 4 gores and grants). Complete rankings are here. Burlington was an important port in the 19th century and boasts a wealth of historic resources. It has long been commonly held that the town was named for the Earl of Burlington, though nobody could identify which of several Earls that might have been. A more immediate possibility is that it was for the Burling family of New York City, politically prominent and wealthy, a combination Benning Wentworth was known to admire. In support of this theory, the records show that nine Burlings are listed as grantees of eleven towns in Vermont, ten of which were recorded the same day. 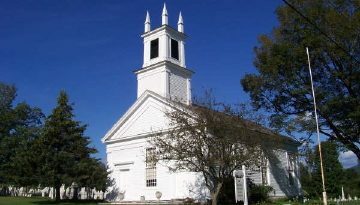 The mystery of the records is that while the Burlings were the grantees of neighboring Colchester, not one is among the grantees of the original town which supposedly bears the family name. Historians conjecture that an overworked property clerk mixed up the paperwork of the two towns on what was one of the busiest days in the grant office’s history. Incorporated as a city by act of the Legislature in 1864, the original town was split into what is now the City of Burlington and a new town of South Burlington. A portion of the original acreage had already been drawn off to form Williston. Battery Street, near the waterfront and site of a ferry landing since the early 1800s, is known for its historic commercial and industrial buildings. More than 200 housing units in the King Street Neighborhood Historic District have been rehabilitated in recent years. Around City Hall Park, originally set aside in the 1790s for a courthouse, are public and commercial buildings, including the Colonial Revival style City Hall; the old Ethan Allen Firehouse; banks and the Art Deco Flynn Theater (a significant success for the arts community: on a downward slide well into the Seventies, now magnificently restored and the site of performances of all types, including concerts, plays and musical theatre). 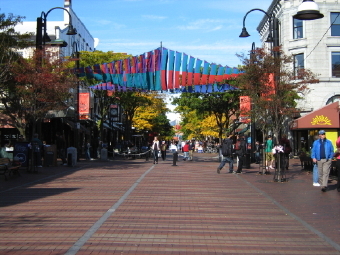 In the late Seventies, several blocks of the main business district were converted to a pedestrian mall. Despite the development of malls and shopping parks elsewhere in the county, the Church Street Marketplace remains a thriving shopping and social center with numerous sidewalk cafes and specialty shops. The Head of Church Street Historic District includes the outstanding Federal style Unitarian Church, the Richardsonian Romanesque Masonic Temple, and a late 19th century department store. Further up the hill, the Pearl Street Historic District presents commercial buildings as well as handsome early to mid 19th-century homes of Burlington’s prosperous mercantile class. Found throughout the “Hill Section” are many significant Italianate, Queen Anne and Colonial Revival style residences of the late 19th and early 20th century, built by Burlington’s well-to-do industrialists and businessmen. Many (if not most) of these are now fraternity or sorority houses or educational buildings associated with the University of Vermont and Champlain College. Others have been converted to apartment houses. At the top of the hill is the University Green Historic District, the home of the University of Vermont and State Agricultural College (the nation’s first state AC and one of its oldest medical schools), founded in 1791. 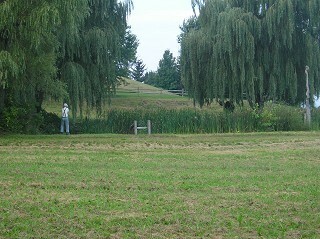 The district has 29 buildings surrounding the green, the land having been donated by Ira Allen and protected from development at his request. Vermont’s largest city, Burlington rests on Lake Champlain, minutes to water, mountains, camping and skiing. 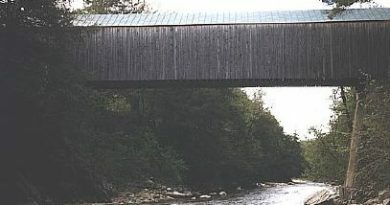 There is easy access to the city by auto (US 7; US 2; I-89 at South Burlington Exits 13 and 14, Winooski Exit 15 and Colchester Exit 16); by rail (AMTRAK at Essex Junction); by water via private boat or ferry from Port Kent, New York; and by air through Burlington International Airport (BTV). 70 live species, over 100 interactive experiences, seasonal changing exhibits and events, all exploring the Ecology, Culture, History, and Opportunity for stewardship of the Lake Champlain Basin. The 2.2 acre Leahy Center environmental campus is also highlighted by the Lake Champlain Basin Program Resource Room, UVM’s Rubenstein Ecosystem Science Laboratory, Lake Champlain Navy Memorial, ECHO’s Eclectic Gift Shop, and green-themed Think! Cafe. A large and varied substance-free celebration beginning New Year’s Eve afternoon, ending with fireworks at midnight. Enjoy performances and activities at 25 venues throughout the city. A 6.5 mile paved recreational trail mostly on a former railbed and mostly close to the lakeshore from one end of the city to the other. It passes through the revitalized Waterfront, the city beaches/campground and residential areas, connecting in the South End to a similar path through South Burlington. A bridge is now in place at the north end to continue across the Winooski River into Colchester. The hope is to eventually have a continuous trail to the Canadian border, crossing Lake Champlain into South Hero via “The Fill ” (former railroad causeway).